What MUST be in writing (for residential tenant)? Under the Act, the landlord is NOT required to have a written lease or rental agreement with the tenant. Nevertheless, both parties are much better off if a written lease or rental agreement is used. 1. The landlord must disclose to the tenant, in writing, at or before the commencement of the tenancy, the name and address of: (1) the property manager (if applicable) and (2) the owner or the owner’s agent (such agent must be authorized to accept notices, demands, and service of process). This information must be kept current and refurnished to the tenant upon request. 2. Out-of-state landlords must have an in-state statutory agent and must provide the name, address and telephone number of the statutory agent to the county assessor and the tenant. 3. The purpose of all nonrefundable fees and charges must be stated in writing. For example, if a cleaning fee is nonrefundable, then the purpose for this nonrefundable fee must be stated in writing. If the landlord does not have/use a written lease or rental agreement, then this information must be in writing and given to the tenant. 4. 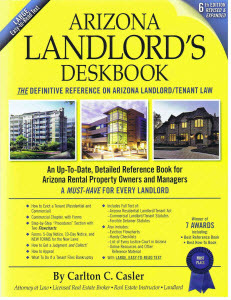 The landlord must give the tenant a notice that the tenant may obtain a copy of the Arizona Residential Landlord and Tenant Act from the Office of the Arizona Secretary of State free of charge. 5. The landlord must give the tenant a move-in inspection form, so that the tenant may document any property defects that existed before tenancy commenced. 6. The landlord must give the tenant a notice that the tenant may be present for the move-out inspection. 7. If the rental property has a pool or spa, the landlord must give the tenant a pool safety notice. 8. If the rental property was build before 1978 or is known to have lead-based paint or lead-based paint hazards, then the landlord must give the tenant a lead-based paint disclosure and comply with other requirement. 9. If the landlord has a real estate license, the landlord must disclose in writing that the landlord is an Arizona real estate licensee. 10. If the lease or rental agreement is for a period of time that is MORE than ONE YEAR (i.e., January 1 to December 31 is for one year; January 1 to January 1 of the following year is for MORE than ONE YEAR), then the lease or rental agreement MUST be in writing because of the statute of frauds. 11. If there is a written lease or rental agreement, all blank spaces must be completed. Any blank lines may render the agreement invalid or unenforceable. 12. If there is a written lease or rental agreement, the landlord must provide the tenant with a signed copy thereof. 13. If the landlord wishes to assess and collect late fees, then the amount of the late fees must be stated in a written lease or rental agreement. As you can see from the foregoing, even if a landlord does not want to use a written lease or rental agreement, the landlord nevertheless MUST provide various written notices to the tenant. Inasmuch as the landlord is required by law to provide some written information, the landlord may as well use a written lease or rental agreement and merely include all the required written notices in the lease or rental agreement.